Sliders are a staple of modern websites, typically displaying an image with a caption and automatically cycling through a series of such slides. Views sliders transition between posts and can contain any content from the post, and are actually a kind of pagination with automatic updates. 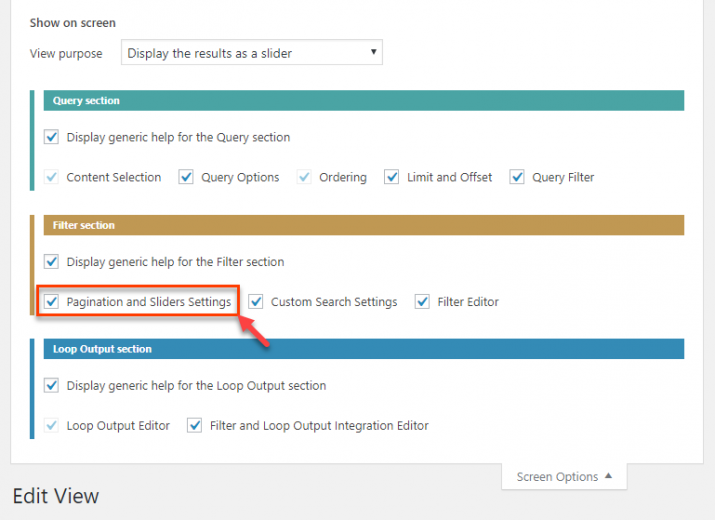 You create a View which queries the database for the posts the slider will cycle through, set the pagination options, then design the output that appears on each slide in the Loop Output section. A slider transitions between posts, so first you need to create a View to generate the list of posts which will act as slides. These can be standard WordPress posts, or custom posts made with Toolset or 3rd parties such as WooCommerce products. Note if you are editing an existing View to convert it to a slider the Pagination and Slider Settings may not be visible, but can be exposed through the Screen Options tab at the top of the page, and you will need to set the options. This will produce a fairly crude slider that could be improved not only with styling but by adding pagination controls to manually advance between slides. We’ll look at both of these in the practical example below. In the accompanying training site the home page includes a featured artists section which shows 3 artist posts. Let’s convert that to a slider which shows one artist at a time. This section is currently generated by a View cell in the Content Layout for the homepage. We could edit this cell by editing the homepage Layout, but we can also edit the underlying View directly and make the required changes there. We want to add pagination controls so that users can manually advance to the next or previous slide. If you save the View and check the results on the front end you should see that the slider works, but the positioning and content of the pagination controls is not what we want, as shown here. We want to move the dot controls below the slides, change the text for the next and previous links to arrows, and move these to the side of the slides. We haven’t mentioned this meta box before. When a View is rendered it comprises two parts, the filter and pagination controls, and the generated list of content. The two shortcodes in this editor insert these two sections on the page. We want to reverse the order (so the pagination controls come after the slide), and we will also add some HTML markup to make targeting these sections with CSS easier. The Featured Artists section should now contain a slider that looks like our objective at the start of this section. Go to the Beyond the Basics support page and leave a comment. Nigel, the author of these pages, or one of the other Toolset team members will reply to you.